Au Revoir Paris, Hello Tokyo and LA! The most popular fashion weeks are over, I had to postpone my blogging due to family health issues but I am back. Now Tokyo fashion week is in full swing, and is actually the longest fashion "week", about three and a half weeks. The fashion week closest to my heart (and me) was Fashion Week LA. My exciting news, being invited to LA Fashion week, my disappointment, LA Fashion Week. I did get to experience being able to sit front row center like someone important, so I guess that was pretty cool. Actually there were a few good lines, but no real names. 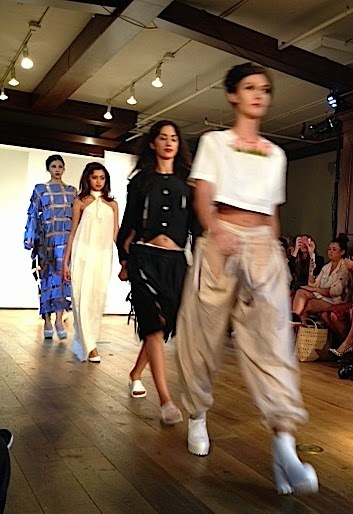 Rochelle Carino showed very wearable separates with bold prints. My favorite designer was Rose La Grua. Her collection was edgy. The fabrics were perfect for Los Angeles, and the garments bordered on art. A few of them had pockets that held flowers, and the finale look was a dress made out of suspended squares of fabric. 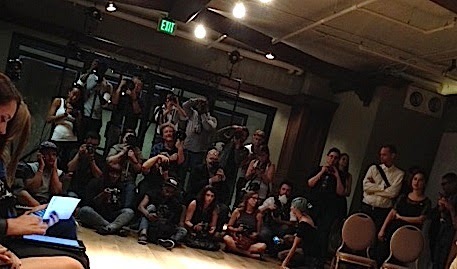 Thought it would be fun to show of photo of all the photographers at the end of the runway! When did LA lose its footing in the fashion world. It seemed in the 1980’s that LA was a pretty big deal. LA doesn’t even have the Mercedes-Benz sponsorship. Even Istanbul is called Mercedes-Benz Fashion Week, I didn't even know there was a fashion week in Istanbul and how did they get the Mercedes-Benz label? Tom Ford did announce that he was moving his Autumn/Winter runway show from London to Los Angeles for the next LA Fashion week in February 2015. I hope this is the start for other designers to follow his lead and resurrect Los Angeles as the fashion city is should be!